Guests are met in Beziers** and transferred by private chauffeured minibus to Athos. A champagne welcome with canapes awaits you and you meet the Captain and crew. Once you are settled into your cabin, you will be invited to your first four-course dinner on board, prepared by your highly skilled chef. After an early breakfast we transfer to the well-acclaimed “La Grande Motte”. It is made up of two 18-hole courses and one 6-hole, designed by Robert Trent-Jones (Senior) in 1987. On your return, a spectacular seafood lunch awaits you, as you move from last evening’s mooring and enter the open-waters of the Etang de Thau. The Etang hosts Europe’s largest mussel and oyster farm. Having cruised across the Etang and on to the Canal du Midi itself, the barge comes to its evening’s shady, pretty moorings at Agde. Dinner on board. After breakfast, transfer to Golf de Fontcaude. We suggest a slightly later start and golf through lunch. An 18-hole international course, it was designed by Chris Pitman in 1991. The Clubhouse is a modern complex where you can stop for lunch when you are ready. Athos begins moving through the famous round lock at Agde and heads towards Beziers. Golfers return to join the last leg of the cruise which is the exciting climb up the staircase locks to scenic Fonserannes. Dinner on board. After breakfast, transfer to “St. Thomas”. This course was designed in 1992 by Patrice Lambert. Along with the beautiful views, it includes an interesting blend of groomed greens, and natural, open and wooded landscape. Athos begins cruising and you meet us at the Malpas Tunnel, and enjoy the traverse through the tunnel as well as a relaxing late-afternoon of cruising towards Regismont le Haut. Your Captain stops the barge momentarily, and we hop off for a short wine-tasting at one of the few remaining traditional-method 19th C wineries. 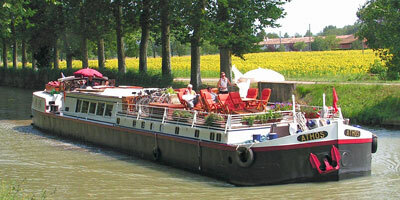 Return to the barge and cruise to the charming domaine of Regismont le Haut. Dinner on board. After breakfast transfer to Oulibo – the local olive oil pressoir. After tasting the organic and wholesome olives (accompanied, by a small glass of rosé!! ), a short drive up the Gorge de la Cesse and into the hilltop village of Minerve is in order. Your tour guide will regale you with the harrowing tale of the Cathar siege launched at Minerve during the 13th C. A long lunch and an afternoon of relaxation and by early evening we arrive in Capestang. There ought to be enough time for an invigorating game of pétanque (over cocktails?!) or a brisk stroll into the village before dinner on board. After breakfast transfer to Golfe de Carcassonne was designed by JP Bascuro. If you are still feeling energetic after golfing, your guide suggests a quick stop-off at the Cité of Carcassonne and a quick look around the Medieval City where you are offered a guided historical visit by your knowledgeable on-board guide. After a look around the city together, there will still be time for browsing those shops, or a refreshing drink in the cafés while watching the busy crowds go by. A late lunch is waiting when you return for the final afternoon of cruising to Argeliers. Farewell Dinner on board. After breakfast, guests are escorted to Beziers** by private chauffeured minibus.